Easy check in with lockbox, this cozy, private, two (2) bedroom plus den apartment on the first floor of the three story triplex has it own little garden with BBQ, and separate private entrance. This is historical building close to Koreatown, Little Italy and Annex neighbourhoods. Lots of space. Rocking chair by the fireplace! The apartment sleeps 7, if necessary. Ideal for two couples or family with 2-3 children. Walking distance to subway Bathurst Station. Location is excellent, 2 min walking to Bloor Street with its restaurants, coffee shops, small stores, Christie park, and bicycle pass. One bicycle is provided or rent more bicycles around the corner. Lockbox at the property, easy check in. Fully equipped kitchen to prepare meals and take out restaurants just few meteres away. One queen size bed in master bedroon, one double bed in the second bedroom and one single bed (extendable) in the den. Plus pull out coach in the living room for extra sleeping space. Parking is available on the street in front of the house for small fee ($25/week). Wi-fi internet is high speed and unlimited. 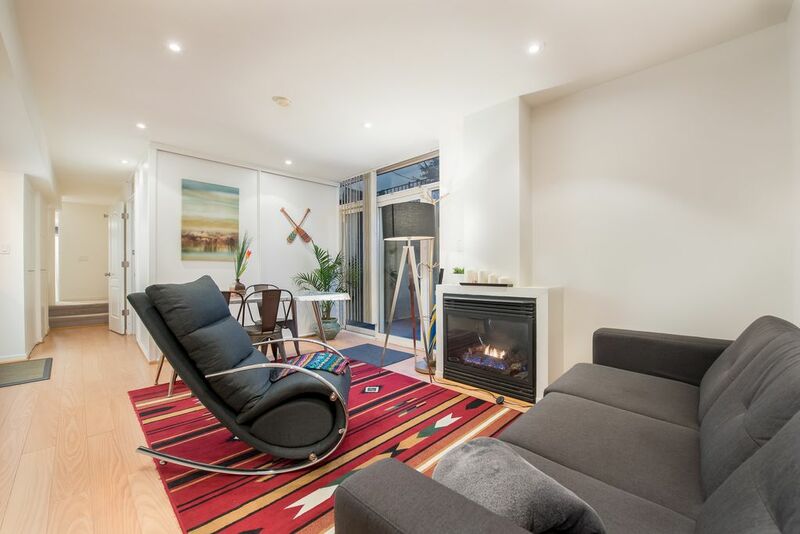 This property is practically downtown Toronto, walking distance to subway, street cars and buses. Really enjoyed the apartment, it was well-maintained and clean. Very comfortable for my family of 3. It was in a good neighborhood and around the side of the building so there was no street noise from cars or pedestrians. Loved the radiant heat in the floors. Comfy, modern, cozy space in an incredible location! We loved our stay in this apartment! The location was absolutely perfect! We loved being able to walk to a variety of shops and restaurants, and it was really convenient to have a parking pass, too. The apartment itself suited our needs very well. Cute, modern (love the heated floors in the bathroom!) and functional. We also really appreciated the thorough notes and the ease of communication with and accessibility of the owner. Would definitely recommend the apartment to others, and if we have the opportunity to return to Toronto, we would love to stay here again! The unit is in a very convenient and safe community. We were visiting my sister who is studying at the university of Toronto. It’s close enough to her while we can still stay out of hair when she finishes her final presentation. It’s walking distance to lots of great restaurants and shops, such as white brick kitchen, which sells very authentic southern fried chicken. If you like bubble tea, there are at least 2 world-class bubble tea shops right at the same street corner. The unit itself is very clean, spacious and well stocked. There is a connected room with a daybed that’s perfect for our 5 year old. She also enjoys the secret garden and stairs a lot! We will definitely recommend this place and come back if we are in Toronto again. The space was a great size and the setup was perfect for a family. The outdoor space is very nice. The neighborhood is very walkable and full of fun, interesting places to discover. A little home away from home in an amazing location! We loved staying here with our 2 kids. Having 2 bathrooms, separate rooms, living room and a kitchen are such a treat when you are traveling! It was cozy and clean and the location can't be beat! The host, Martha and her son Stephen are so friendly and do everything possible to make sure you have everything you need. I would agree with others that the only negative thing I could say is there could be some bowls available. Small negative for all the positives! Thanks again and we will be back!!! Thank you so much, Bridget, for your review. Yea, the bowls.... Will make it happen next time. Hope you come again soon. The apartment was a great size with the bedrooms separated by the living area which was nice. My sister visited Toronto from the United States to visit childhood friends. The property is wonderfully located. We were able to get to a grocery store very easily. It is a lovely neighborhood with everything within walking distance. The property was quiet and clean. We felt very safe. Martha answered all our questions via email very quickly. We rented a car and had no trouble parking every night on the street close to the apartment. We would definitely rent again. We charge damage deposit for pets. Let us know if you plan to bring your four legged friends.